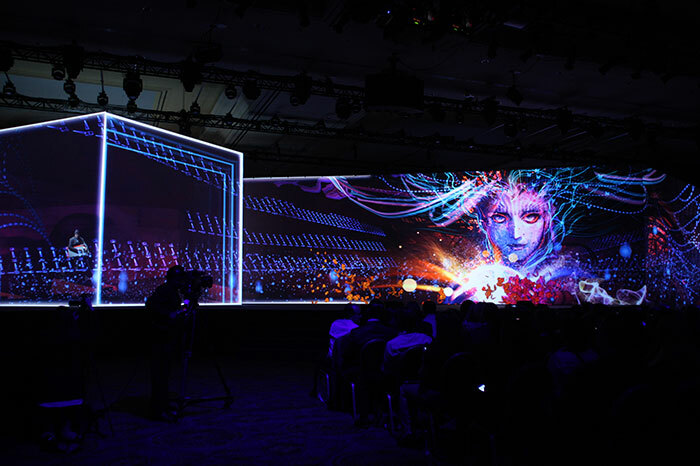 Tustin (June 18, 2014) – WorldStage marked its tenth year supporting the annual Cisco Partner Summit by providing its AV expertise and equipment to the general sessions of the 2014 conference in the Venetian Hotel ballroom in Las Vegas. Hired by InVision Communications, WorldStage executed a very complex design for the summit, which was staged for Cisco’s channel network. The ballroom was dominated by a ribbon of six projection screens, all of them angled in a forced perspective set design. They boasted a 9322×1254 pixel map for speaker support, demos and entertainment by the Magnetic Poets, Android Jones, Mason Bates and the Las Vegas Youth Orchestra. At WorldStage Florian Mosleh was media consultant and Pandora programmer, Luke Frey and Charlotte Ibarra projectionists and Kenny Stanford freelance video director.